Just over a year ago, we were in Montana to celebrate the wedding of my cousin Kyle and his wife Tasha. The whole family headed west (and north) for a really great trip. We celebrated, laughed, and of course ate our way through Billings and the surrounding area. One of my favorite things to do is visit farmers' markets and food markets when we're travelling. Our trip to Montana coincided with the first Billings Farmers' Market of the season last year. There were fruits, veggies, baked goods, roasted nuts, jams, meats, eggrolls and more. We had a wonderful time! To read more about our Montana trip, check out my post from last year. I guarantee you'll want to head to Montana after reading. My uncle in Billings sent me an email over the weekend about his farmers' market find at the Billings market. Since he helped design my fun Good Cook Doris header, I'm happy to include his find as today's post. This lovely tidbit is from the Farmers Market here in Billings. 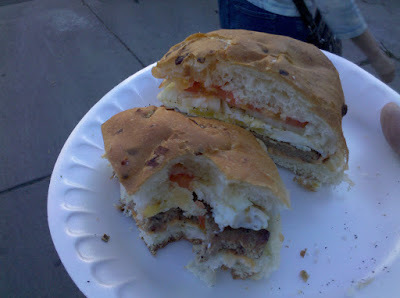 It is a turkey sausage breakfast sandwich with a fried egg, sausage of course, cheddar cheese, tomato and onion, all on a cheese and onion bun. Yummy! I’ll go out and get a cookie or pastry for desert in a little bit. Thanks Uncle Rick for sending the delicious photo and post! Readers, where have you found great food markets or farmers' markets in your travels? That's one great sandwich and the steak below looks delicious! I'm new here and will enjoy following you to see what's cooking! Thanks Pam! Thanks for stopping by! I love your comments! Let me know what you think!